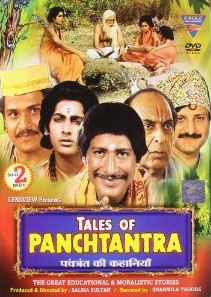 It is the story of a greedy barber, who tried copying actions of a elderly gentleman Manibhadra. The ancestors of Manibhadra were wealthy and they have had a huge amount of gold and silver available as their own asset. But as the wheel of time moves, the ups and downs are there to come. The situation of wealthy Manibhadra somehow changed so drastically that he became poor. He was thinking of committing suicide as he have no money to live with. One night he got asleep thinking the same. He came face-to-face with a divine figure, who as later revealed was the God. Manibhadra was not able to identify the God as he was look like a beggar. The poor fellow thought, if the God himself is living in such condition how can I ask to bless me with fortune? Though the God have asked him to explain his reason of worry and affirmed that he will help him as the ancestors of Manibhadra was devoted to the God, now it is God’s turn to return the favor. Manibhadra asked him his problems which is mainly the poverty. The God told him that tomorrow I will come to your place as a beggar. When I ask you to give me some of your belongings, hit me hard with the stick and I will be dead. The poor felow asked that he could not think to kill the God even in his dreams, and refused to follow the plan. The God than asked “I know you couldn’t think killing me, but do you think, if you even try to kill me, can you (kill me)? or can anyone else?, so please don’t use your logic and follow my words. When I will be dead, my entire body will be converted to the gold. That gold will be your fortune and will help you to get rid of the poverty”. The poor fellow agrees. At the next moment he found that the God has gone, he thought of the entire incident as a dream. There is a barber living in the same village, who was also poor and was scold of by his wife on the regular bases. On the next morning the same beggar (as described by the God) came begging to his place. The poor fellow have followed the God’s instructions and hit the poor begged hard. In few moments, the beggar’s body converted to that of pure gold. When he was dragging the body of gold, to his home; the entire incident was being oversee by that barber. When the barber came to him and asked about the strange incident, Manibhadra offered him some amount of gold to not reveal the information to anyone else. The barber though insisted to know the details of the incident and refused the offer of gold, but promised to not to reveal the event details to anyone else. Manibhadra told him everything and he left for his work. The barber got captured in the lust of the wealth and thought to repeat the incident with himself to get wealth. In the process of day dreaming of getting a large of gold, he accidentally cut the ear of a muscleman in his village, who then beat him. In the hope to get all his future and fortune will change the next morning; he asked her wife to get a heavy stick and place it near his bed, so he need not to search for that in the morning. On the next morning… well, whatever happened the next morning, is a mystery which you may watch on your own.